These are terrific Fossil Garfish Scales. Stunning jet black & a little brown patina and beautifully enameled. What fossilized scale armor! The Garfish is truly a Prehistoric Fossil that is with us today. There is no repairs or restorations on these scales. Actual Specimen Pictured & Guaranteed Authentic. The Garfish is a great example of a living fossil that has been in North American waters for the last 50 Million Years! It is almost unchanged since the days that it lived in those prehistoric swamps. This primitive fish has been able to survive all that time. Fossil Gar Scales are known as far back as the Cretaceous Period, about 110 Million Years ago. 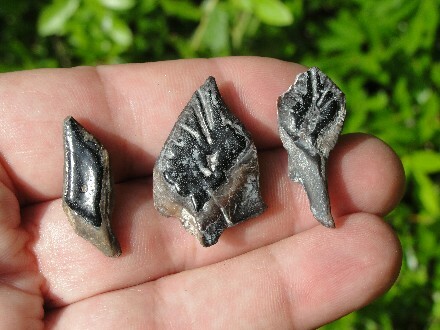 Fossil Scales are found all over Florida. 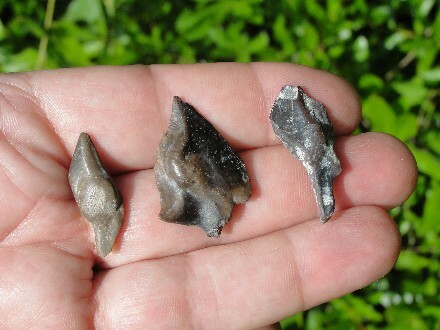 Good examples are the ones from the Pliocene Deposits of Sarasota County, Florida, dating back 2-3 Million Years ago.